nounnium products mmrtL .fea^fem jr"f'JTIfT/Jf-^ J^k. 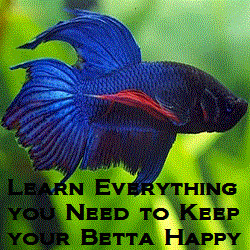 bettas and more place in Lichfield called Betta Pets and was taken there by one of our hosts. I was encouraged to see a store well identified with two signs: Betta Pets and Betta Pets 2. I was puzzled by the origin of the two names. I entered and found some young men working with customers. While I waited I looked around and found a typical, reasonably well-stocked pet store inventory. But I didn't see any fish, let alone bettas. When I finally got to talk to one of the guys working there I learned that they had only recently purchased the business and were in the process of building it back up. They intended to add fish but didn't know when that might happen. Consequently, my first attempt to find bettas on my trip failed. I had better luck in a town called Notodden, about a three-hour drive west of Oslo, Norway. It was located much closer to the 60 degree north latitude and on the banks of a spectacular fjord. We found lodging in a onetime orphanage being developed into a small hotel. The location and its stunning view enticed^s to stay two extra days. One of the local features^s one of the few remaining centuries-old stave churches. Another was a pet store calledJhgNotodden Zoo. This "zoo" was actually a large pet shop that occupied the basement and ground floor of a large building. The pet store part was well stocked with all kinds of pet equipment, foods and other supplies. It reminded me of an old-fashioned general store with merchandise stacked, stored, hung and otherwise intruding on the several aisles meant for shoppers. There was a room for cage birds, another for small animals and an excellent fish room. The tanks were well stocked with an unexpectedly wide variety of healthy and appealing fish and plants. Best of all, I found some bettas! There weren't many, only six, and they were all the same color and in good shape, which suggested that there was som^jind^if market for them. One sign of the level of interest in aquaria by the locals was the fact that the owners were kept so busy working with customers that it was difficult to get free time to talk to them. I asked about that, and they assured me that there was a lively and active interest in all kinds of pets, mEading fish. This assertion seemed well supported by what I could observe of the store and the traffic passing through it. I asked them where they obtained their fish and was told they came from a distributor in Sweden. So, in a place where I might have expected the favorite pastimes to be skiing, hunting seals or dog sledding rather than tropical fishkeeping, I was pleased to have been proven wrong. Thankfully, the aquarium hobby is alive and well in the far north of this Norwegian town. Following a line of latitude around the world will not reveal uniform conditions along the way. In spite of their apparent location in the far north, local climates are moderated in northern Eurilfc by the Gulf Stream and in the northern Pacific and Alaska by the Japan Current. iene Lucas, Ph. D., is a retired biology professor from Drake University and an avid betta fancier. 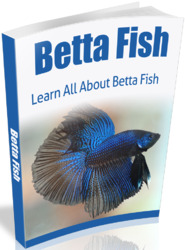 He developed the symbolic system and nomenclature most betta breeders use today. The wafer clarifier and nitmBemover! C? Clears green wafer! C? Reef recommended! c^ Clears cloudy water! 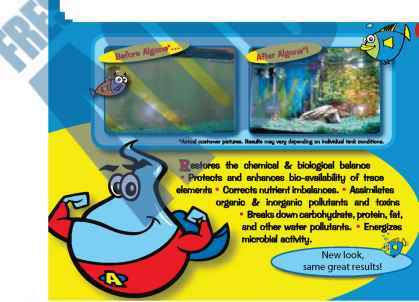 C^ Safe for aquatic plants! C^ Creates crystal-clear water! Ask for it at your local Retailer!